Former Overport Lodge mare Delightful Memphis has taken out an opening $US40,000 leg of the Blue Chp Matchmaker Series for mares at Yonkers Raceway. The daughter of Bettor’s Delight and Memphis Melody showed a good sense of timing from third spot approaching the turn to catch front-running fellow ex-Kiwi Bettor Joy on the line. Delightful Memphis, shown when racing in Australia for the Mark Jones stable. 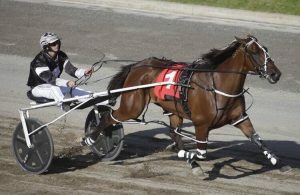 Racing as Delightfulmemphisn in the USA, she scored by a nose in 1:53 for the mile, two laps of the Yonkers circuit on Saturday, March 16 (NZ time). Trained in North America by “Nifty” Norman, Delightful Memphis became the seasonal USA leader for yearly earnings for the aged pacers after Saturday. She’s raced eight times this year for five wins and two seconds, earning $US92,250 in stakes. Another former NZ and Canterbury mare in Seaswift Joy was also successful in a $40,000 Matchmaker Series Heat, leading throughout from the six gate and holding in 1:52.2. Seaswift Joy (Bettor’s Delight-Swift Belle), formerly trained in NZ by Malcolm Shinn and now racing for the Tony Alagna stable, has won three of her five North America starts for the year, and finished second in the other, for $48,815 in stakes. This was the quickest of the five Matchmaker Heats, 0.1 of a second quicker than fellow NZ-bred and top USA mare Shartin N (Tintin In America-Bagdarin), paced in the next heat.